Pictured (l-r) Cassi Villers, middle grades education major; Meca Williams-Johnson, Ph.D; Anna Dowdell, early childhood education major; Kayleigh Hunter, early childhood education major. Georgia Southern University College of Education faculty and students presented at the 31st annual National Conference on Undergraduate Research held April 6-8 in Memphis, TN. Associate Professors Kymberly Harris, Ph.D., Department of Teaching and Learning and Meca Williams-Johnson, Ph.D., Department of Curriculum, Foundations, and Reading served as faculty mentors for five undergraduate students who were accepted to present at the conference. Early childhood education major Anna Dowdell presented “Preferred Behavioral Management Strategies in 3rd – 5th Grade Teachers.” Her research examined classroom management procedures and strategies by interviewing teachers about their behavioral management plans and observing the teacher’s classroom to see their plans in action. Kayleigh Hunter, early childhood education major, presented a session titled, “Technology and Student Achievement in STEM Subjects: Perspectives from Teachers in Grades 3rd–5th.” Her presentation centered around teachers’ perspectives of their roles and responsibilities of integrating technology in the classroom and the influence technology has on the achievement of students. Middle grades education major Cassandra Villers presented information on middle school students’ thoughts and perspectives of what motivates them in the classroom. Her session, titled “Characteristics of an Engaging Middle Grades Classroom,” explored students’ suggestions of what they would like to see from their teachers in terms of engagement and stimulation that could improve learning quality. Pictured (l-r): Kymberly Harris, Ph.D.; special education majors Samantha D’Amato and Kaitlin Spell. 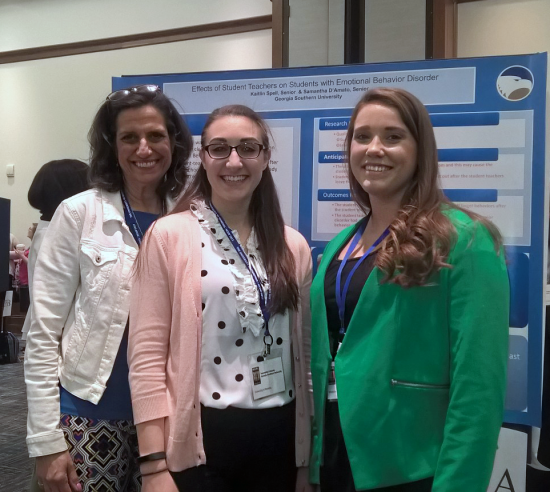 Special education majors Kaitlin Spell and Samantha D’Amato participated in a poster presentation. Their presentation, titled “Effects of Student Teachers on Students with Emotional Behavior Disorder,” explored the presence of student teachers in the classroom and the adverse effect it had on a student with emotional behavior disorder after leaving the classroom at the end of their six-week rotation. Harris explained that for the students, especially in the special education field, research influences their careers. “It was especially telling to hear students say ‘teachers work with data all the time, and using data to make decisions about student outcomes is important.’ The recognition that their profession is indeed research-driven is extremely important when determining what and how to teach in classrooms,” Harris said. Williams-Johnson has observed several undergraduate students participating in research and believes these projects help to develop students’ interest in graduate study and advances their professional development. Williams-Johnson and Harris also presented a session for faculty attendees at the conference titled, “Making Research Authentic: Data Collection in an Undergrad Special Education Program.” During the presentation, they presented information from both their personal and colleagues’ experiences in implementing a redesign of the undergraduate special education curriculum to include research components. 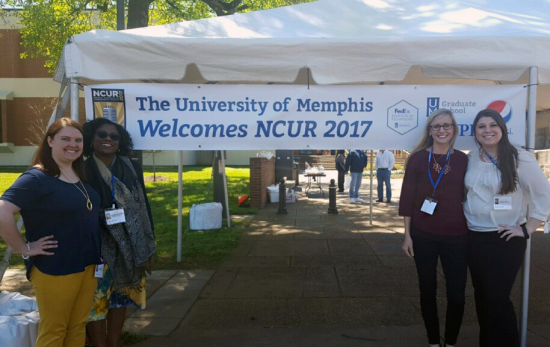 The National Conference on Undergraduate Research is hosted each year by the Council on Undergraduate Research(CUR). CUR focuses on providing undergraduate research opportunities for faculty and students. CUR provides support for faculty, administrator, and student development.